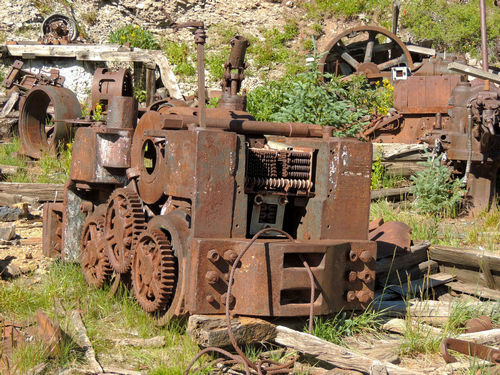 Hike a half mile to see a lot of old equipment at the Atlas Mine. Steep uphill coming back out. 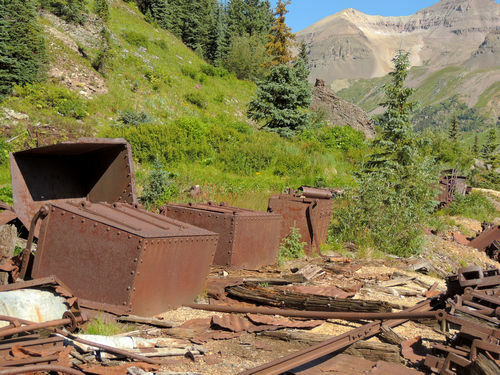 This mine is located on a carved out shelf on the mountain side at the foot of Sidney Basin, where it can be seen some 600 feet above the modern Revenue Mine. 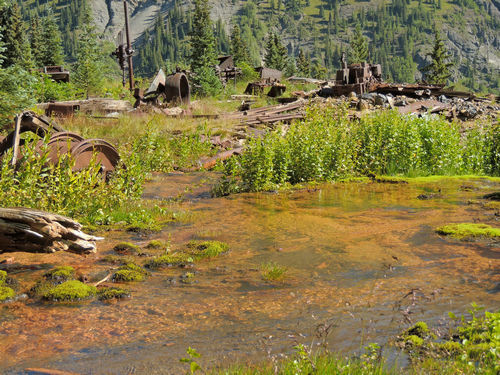 The original mining claim was found around 1876, but the manufacturing was in 1900. It had a relatively short period of operation for unknown reasons. 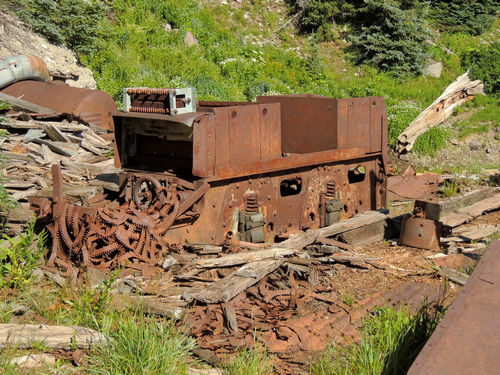 Today all of the structures are gone, but even so there still remains a great deal of equipment at the mouth of the mine. 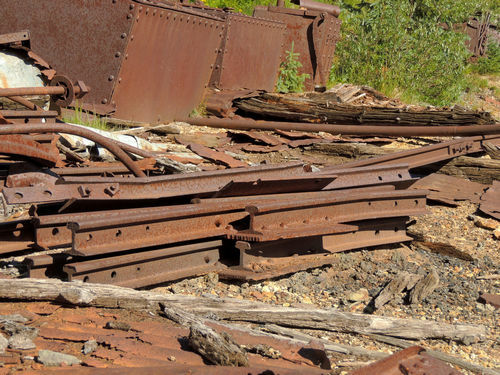 Tracks and cables still connect the high mine to the ruins of the immense Stamp Mill. 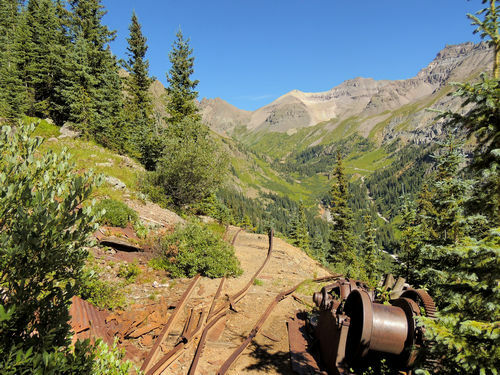 Surrounding the mill was once the town of Sneffels, a fall service community that is no longer in existence. 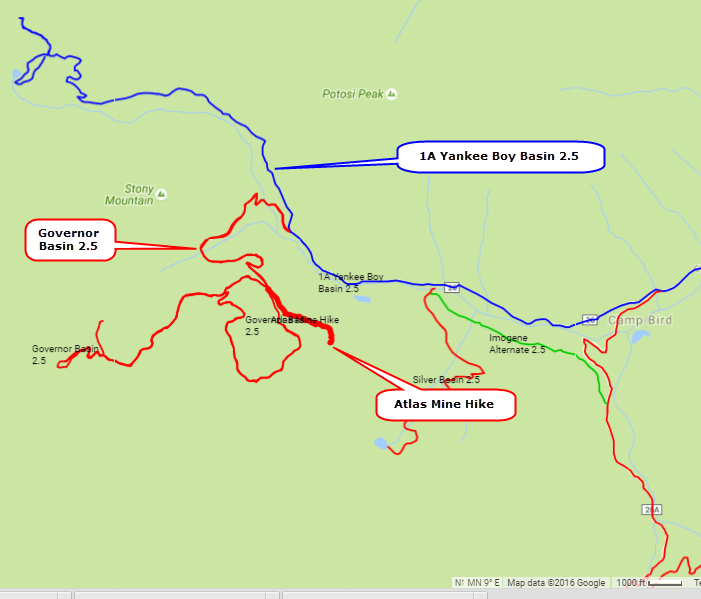 There is a GPS - GPX track at the bottom of this page. 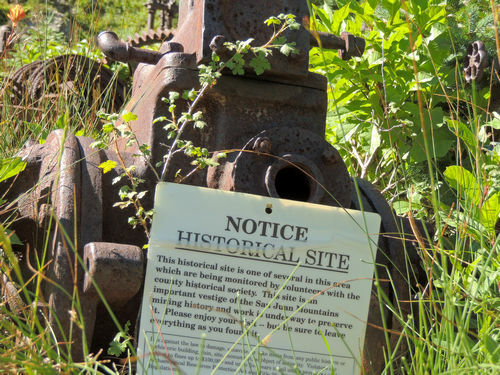 Do not know the history of the mine, so can only show some photos to help you decide if you want to take a hike. It is only a half mile, but is quite steep uphill coming back out. Please, please, please! 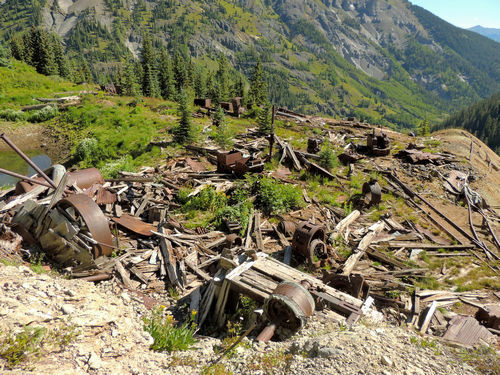 The Atlas mine is one of the most complete historical mines in the state, and it would be a shame to see more go missing from it. Please do not disturb any of the items, and do not take anything - even a tiny item for a souvenir. Leave the site for others to enjoy, as I am sure you will. 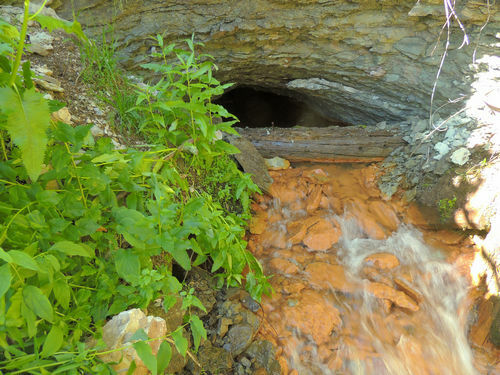 There is a pile of rock at the mouth of the mine, and the mine is full of water. There is a great deal of equipment in the area. I cannot identify most of it, but have numbered each photo. If you know what something is please contact me and I will identify it here. Update: Gabe Cangelosi told me what the items were so they are now described. THANK YOU GABE! Photo 1. 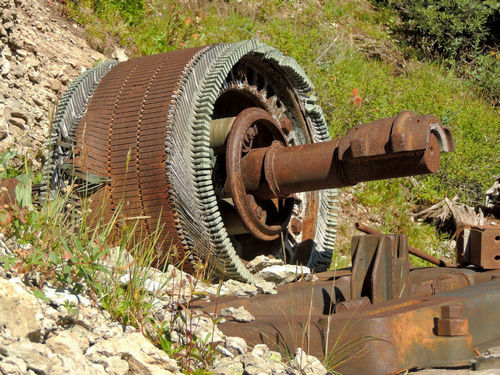 This is the rotor of an electric motor. It probably got taken out when the copper was scrapped out of the motor. Photo 2. This is a pneumatic drill sharpener. It would sharpen the drill bits used to drill holes in the rock. Photo 3. This is the drill that would use those bits to drill holes. 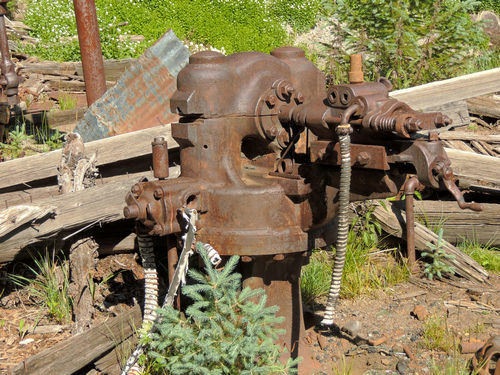 It is on a jackstand (the big pole), which would hold the drill while it drilled, so the miners did not have to hold it straight for that long (they were quite heavy). 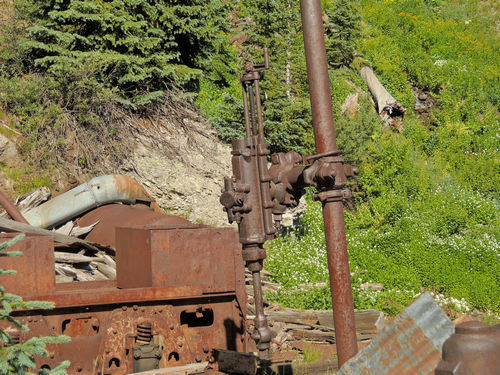 The drill would have been perpendicular to the stand, and the crank that's on the top would have faced the miner who would have cranked it slowly to advance it into the rock. Photo 4. These are the trucks for ore carts. They would have connected together on the ends and been pulled by the trammer as a train. Photo 5. 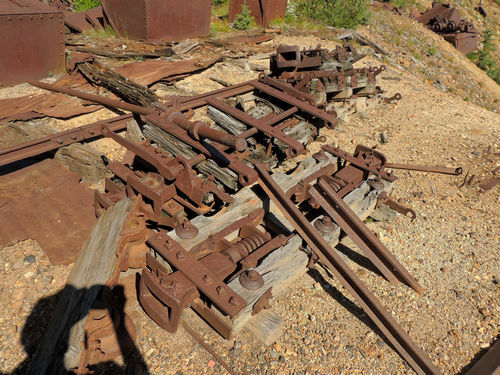 These are the bodies of the ore carts. It's hard to tell from the photos, but they look like they were side-dumping. Also hard to tell without knowing the scale, but they would generally hold about a ton of rock each when full. Photo 6. This is the trammer that pulled the train. It was electrically driven with batteries, since combustion engines were difficult to use underground. The notched strips of metal on the left were pulled out of it when the scrappers were stealing the copper from it. The tank on the left side of it is an air receiver tank. It would have been connected to the air compressor, then acted as a "battery" to feed the air to the drills. It also helped reduce the oscillating effect of the compressor which made the drills difficult to use without it. Photo 7. Another view of the trammer. It is an exceedingly rare piece of equipment to see. The big wheel behind it to the right is the flywheel for an air compressor, which powered the drills and other equipment.